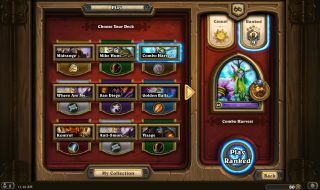 Hearthstone's 4.2.0 patch has blazed it's way onto the Battle.net launcher, bringing with it the solution to the community's longest standing issue with the game: The lack of deck slots. You can read the patch notes by way of Hearthead, but we can confirm there are now indeed 18 deck slots available for you to create slightly different builds of Secret Paladin. Deck recipes have also been implemented to help new or creatively-challenged players cook up new decks, and there's a new Paladin Hero as well: Lady Liadrin, the leader of the Blood Knights in World of Warcraft. The site says Lady Liadrin, who's presumably another animated reskin, will be obtainable through an upcoming WoW promotion, but there's no word how (or even if) she'll be available to anyone who doesn't play World of Warcraft. I've reached out to Blizzard for clarification on that point and will update when I receive a reply. There are no patch notes on Battle.net as of yet, but the update also includes new card backs, a slew of new cards, and makes a handful of smaller changes as well. We've taken a few screens, too, so you can get an idea of how the UI works. Turns out the technology Blizzard was waiting for all this time was just a big arrow and some hover text. Update: Blizzard has confirmed that the only way to acquire the Lady Liadrin Paladin Hero is to take a World of Warcraft character to level 20.